Texas Cotton Gin Museum, Inc. This event started in April 1990 and has continued over the years to remain a small family oriented festival. 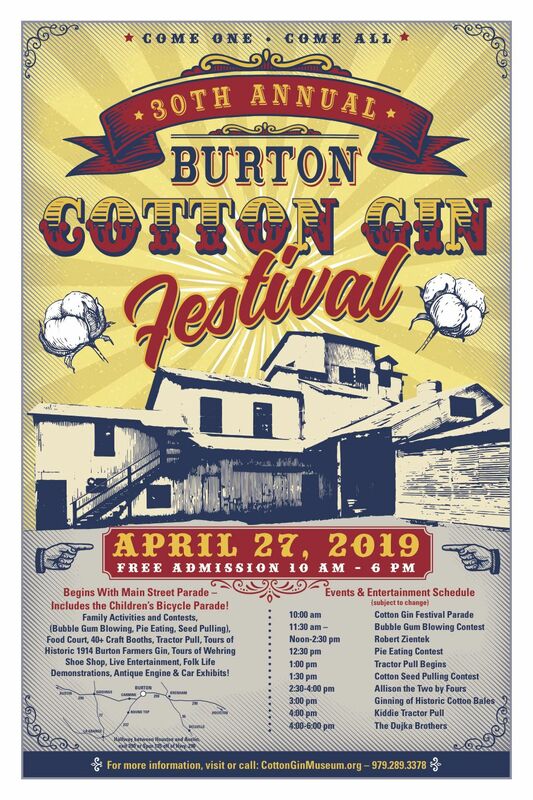 We celebrate cotton and the heritage it has in our community.The Burton Farmers Gin was built in 1914 and closed in 1974. It is the oldest operating cotton gin in America with 1925 Bessemer Engine. We gin and bale cotton at our event. We also have a parade, live entertainment, 50+ craft booths, food court, folk life demonstrations, tractor pull… something for everyone. We have an average attendance of 5,000 people. Come celebrate the legacy of cotton. Nine acres of family fun!